Now, remind me again, what is it that newspaper publishers are always saying about respecting copyright? 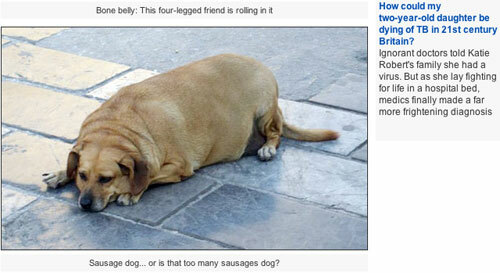 I only ask because of this article on the Daily Mail site today about fat pets. As I scrolled down I recognised one of the dogs pictured. He is a local chum of ours from Chania harbour. In fact, I recognised the photograph - posted to Flickr by polietileno. The unnamed Daily Mail journalist who put the article together appears to have simply searched Flickr for 'fat dog', and re-published whatever photos they felt like from the results set. The Chania dog picture was originally published under an Attribution-Non-Commercial-Share Alike 2.0 Generic licence, which the Daily Mail has almost stuck to. Well, except for the Attribution bit. The article also features this photo from Flickr, and this one - both of which are clearly marked '© All rights reserved'. 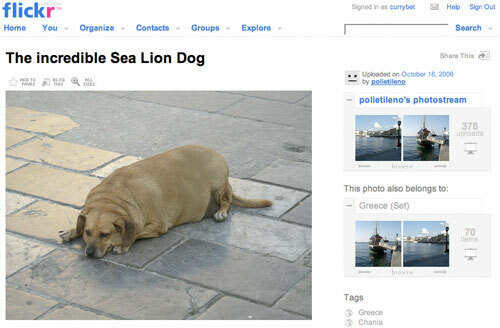 And then there is the fact that the article says these are the world's fattest pets, even though 'fat dog from Chania' is a stray - which they would know if they read the comment underneath the photograph they have stolen. But what's a little factual inaccuracy and copyright theft between friends eh? By Martin Belam on 13 May 2008.
tell your friend to send an invoice to the daily mail. I read a similar article online somewhere recently; they took a similar course of action. I can't remember where though. There are plenty of stories of similar things happening to B3ta contributors. A quick search of Tim Ireland's Bloggerheads site should find some examples. As Ian said, the best approach is for the owners of the rights to invoice the paper. But, of course, the owners might not be reading your blog. So I suggest leaving comments for them on Flickr pointing out what you have found. ""But there isn't any rule," they come back, "against copying stuff off a website, is there?"" All the images are scammed from other websites. In fact, they might as well have just copy/pasted this website into their CMS. I'm increasingly thinking that a scraper that grabs every image off newspaper websites and submits them to http://tineye.com/ to see where they were "acquired" from might be a good idea.